Embrocation by definition is a liquid used for bathing or moistening any diseased part; now usually restricted to applied by rubbing; a liniment. Embrocation Volume 4 – with Molly Cameron from j. dunn on Vimeo. 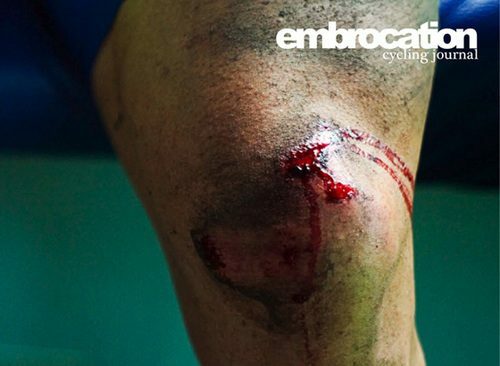 The Embrocation Cycling Journal looks at the metaphor of embrocation and bicycles, calling it the essence of cycling. The journal is packed with full-color photos, stories and is printed on premium paper. $24 shipped and based on the preview, worth every penny. The first issue of Embrocation Cycling Journal was released in January, 2008. Inspired in equal parts by cyclocross racing, road riding and die-hard commuters the journal is an outlet for writers, artists and photographers to express themselves and tell their stories. Each journal is a grassroots publication that draws content from a wide variety of writers, artists and photographers and compiles this content in a high-quality, stylized book, each with a unique design concept. With the support of riders, commuters, racers, mechanics, frame builders and the like, each issue of Embrocation is an ever-evolving cross-section of the cycling community at large.